Y'all, I feel like April just almost did me in. It was truly the month in which I could not, did not, keep up. Didn't keep up with my daily drawings (I stopped mid-month). Didn't keep up with pottery (tried to, but). Didn't keep up with friends. Retreated and got frustrated and angry and had to have a big fat time out. Last week we had a large discussion around the dinner table about taking ownership of your decisions and their outcomes and just making the best of what you're left with in the aftermath of your decisions, good or bad. No whining, no blaming, just taking what's in front of you and making the best you/life/decision you can with what you have. Ownership. So I'm moving on from April because it's the second week of May. No more dwelling on failed pots or plans or anything else that happened that I can't do anything about. Moving on. I'm able to move forward in part because of the support and encouragement of so many of y'all- two emails over the weekend, in particular, were especially encouraging when I was ready to just throw in the towel. So thank you, especially, Richard and Gail. And you countless other friends who have been thinking good thoughts and sending me well wishes and saying nice things when I whine in public forums. It means a lot. I did have a long long chat this morning with the technician at Standard Ceramics company, one of the largest clay manufacturers in the country and the maker of most of the clay bodies I use, including my favorite that suddenly seemed to go haywire on me. Julie was wonderful. She is sending me a new clay to test and is testing my old favorite with the glazes that had been giving me the most problems. I can't even tell you how grateful I am that she took my questions seriously and is helping me to find solutions to either making my old clay and glazes work or finding a new go-to clay body. Today it is raining and I am glazing and firing a little load of herb markers and those pieces I made with Mississippi river clay inlay. My little Jan term is almost over. I feel like I've worked a lot and been really lazy. Played with new ideas, produced quite a lot, drew quite a lot, and am ready to keep moving. I am really quite pleased with my yarn bowls- I have a few other ideas that I'm working on and waiting to dry long enough to fire and glaze. I'll admit that I hesitated before making them because, well, I didn't see the point. I keep my yarn in a project bag at my feet, so I didn't see the need for one. But my knitting friends prevailed upon me and I made a few testers. Now that I've used one, I get it. After I broke my favorite cup earlier this fall, I had to make my own tall tumbler. This photo seems to have led to a request for a virtual twitter tea party. I need to get to work! This fat little teapot is the first I've made in several years. I got a wild hair this fall to make one (and the hex stamps are a direct result of my visit to Heath Ceramics) in October/November, and didn't glaze it until just last week. I think I'll make more. These bright blue mugs and saucers are for a customer who's ordered her dinnerware set in a piecemeal fashion- plates, then cups, then teacups, then bowls, another set of bowls, a set of dessert plates. This last round has been what you see here, plus red egg cups, and a set of vases. I'm ready to get the little niggly reglaze work done on these and send them out the door. Finally, y'all have helped me raise well over $200 for my friend Angela through the sale of the Emily Dickinson hope pieces. I am ever so grateful, because, friends, that's $200 in one single week. As in, last Monday, January 23, to this Monday, January 30. Thank you, thank you, thank you. I'll have more tumblers later this week (in the bisque kiln now), and some new colorways on the trays in another week. I hope your week is a lovely one. Thanks for being here with me. I made a little mosaic. Actually, there are three. This year and been good and hard and crazy and glorious. I have part-time help, retail accounts, three publications, a show, several wipe-outs, and I am just now getting back to being ready to work and getting excited about what 2012 will bring. I hope y'all have a great new year's eve and a wonderful new beginning to 2012. See you soon. Today I am thankful to be *almost* all better. I am thankful for a Thanksgiving meal at my mother's house that was the most colorful, vegetable-filled meal I think I've ever eaten. I am thankful that I was able to bring my favorite harvest dishes, like this (dairy-free, panko-topped) take on this tomato cobbler. And I'm thankful that there were still plenty of fresh local cherry tomatoes at my favorite farmers' restaurant/grocery last night. I'm thankful that my good friend and studio helper has more sense than I do and sent me back to bed on Tuesday (or Monday. I'm not sure anymore) and told me that I was too sick to work. And I'm thankful that she told me that I was too sick to do the Tsunami Sale on Sunday. Because truly, if I'd tried to press though, I would still be sick. I'm sorry that I'm not doing the sale, but also not. I'll have work available by appointment if you're local, and online in the coming weeks. This week I'm putting a lot on Etsy (I hope. I think). And I'm thankful to y'all for continuing to read my ramblings and support me with your encouraging words and your business. It means so much. I hope you all had a beautiful Thanksgiving and your coming holiday season is a joyous one. I'm so happy to be finished with both. My third collection should be finished this week. This is the dinner set that I referred to as "green ware" in my last post. "Green" means that it hasn't been fired. I have to remake one mug and three desert plates, plus do some spot-reglazing on almost every piece in this set, but the bulk of the work is done and I'm not sweating over it anymore. Plus, I have an incentive to get it (and two other big projects) off my plate. I'm going to San Francisco (tagging along on a work trip) the first of October and I want a clear slate before I leave. This means that September will be busy, but that's good because I need immediate goals to stay focused and productive. Now I know this about myself, but it's always good to have it reaffirmed. This coming week I'll attack those other two projects with a vengeance and get these pieces re-spot-glazed. I'm grateful today that they're 4/5 finished, that my bout with the flu was short-lived (but oh! I got LOTS of rest, which I needed), that my friends on the East Coast are safe and the hurricane packed less of a punch than we anticipated, and that I finally got a batch of okra pickled and processed. Hope y'all have a good week. Good morning! It is a gray and rainy Friday in Memphis. I can hardly believe that it's Friday already. The week's flown by. I've gotten some good work done, had a good initial meeting with a new retailer and am developing some work especially for their shop. It's exciting to have a new direction to work in- taking someone else's idea and making it mine. I've made two big batches of limoncello for 2011's holiday gifts- plain and gingered this year- last year's batch was rosemary-flavored and spiced-blood-orange. I have just a bit more than one pint of each left; I'm guarding them with my life! This weekend is supposed to be rainy the entire weekend. With no definitive plans on the books, I'm going to try to get all of my glazing in - I have almost a dozen honey pots to glaze- at least 6 will go into the shop next week. I'm overdue with a restock in the shop. my dear sister, and she had the same wonderful feelings. This, friends, is why I keep working. My dearest desire is that my work will impart some extra meaning and joy into normal everyday life. That you'll use a mug, plate, eggcup, bowl on a daily basis, enjoy it, wash it, eat in it. This email counteracts every single small criticism that I get from other customers (though there are not many) or from my own hyper-critical inner voice. Ok. Have a good weekend. See you next week! The cup on the left is the first cup I made. I wanted something simple and less expensive than the other cups I've made in this technique . I had a small handmade cup that had nice clean, straight lines, so I used that form and added the bee. I didn't feel like it hit the mark. The text was wrong, my surface design was way off (I took some shortcuts and just plain old did it wrong), but the cup felt good. I like drinking from it, but it isn't visually pleasing to me. The cup on the left is closer to what I had in mind. It is slightly wider and shorter, and I cleaned up my surface decorating process. There are three of these, with three different drawings, and with two of them I feel like I'm 95% there. I'm not shooting for perfection (perfect = not made by hand= no room for personality= graceless), just another tweak or two. I'm happy with this one and will make more soon. I really had the best day yesterday. In addition to the good kiln-unloading, I had studio help (a friend is coming over once a week for a few hours to help me in the studio- it's a godsend! ), yoga class, shipped several big orders, and best of all, received so much really affirming feedback from a little profile that ran in our paper. It is always nice to hear from friends, family, and acquaintances who let you know that you're on the right path. I'm so grateful for the life I live and the blessings I receive from everyone in my life. *last week I opened the kiln to find that either my glaze was contaminated or some sort of ash/mineral/who-even-knows had settled on the top of two large white platters strewn with ginkgos. They were so nice, except that they were randomly speckled with black. I was so upset and have since shop-vac-ed the kiln thouroughly and strained my white glaze. The problem must have been solved as these pieces aren't speckled with the same black. But oh, it was disappointing. 2010 has been a big year for me. Sales have been slower than in years past because of the economy, which means that purchases are intentional. People who are buying my pottery are really thinking about their purchases, weighing them, choosing to go without other things in order to buy my work. I appreciate each and every one of your purchases this year. I know that everyone has a choice in how they spend their money. I'm so grateful for my customers. I'm delighted with the pieces I made based on Diana Fayt's techniques. And I love my new pitchers inspired by silver hollowware. I did a little more handbuilding this year, and because my arms are bothering me, I anticipate doing even more in 2011. If my throwing days are limited due to tendon pain in my arms, I'm not throwing things that I don't like or I've grown tired of. The egg cups! Oh my- the Southern Living response has been tremendous. I'm just tickled by that. It's been quite a year. I have some plans for 2011, some new ideas to try, some new marketing ideas, too. Happy New Year friends! Be well, safe, and happy. *I just finished my 365 photo project/play-a-long here. Not sure if I'll do one in 2011, but I'm glad I did in 2010. Hi. How are you? I haven't been in this space much because, honestly, I've overscheduled myself. After a solid year of working as hard as I can to keep my family financially and emotionally afloat during unemployment and morale crises,* I'm tuckered out. It's been a year full of amazing highs and seemingly bottomless lows, and I am ready to re-prioritize. I have focused most of my production for local markets this year- two shops I'm thrilled to be associated with, my local farmers market, and my long time customers, friends, and family who live in and around Memphis. I've really neglected my online customers and my Etsy shop this year. I had big plans for listing things online near Thanksgiving, but low- Thanksgiving is this week and everything I've managed to make is either for local stores and shows or a really big thing that's coming up in mid-December, completely unrelated to the holidays. I think, realistically, that I won't be able to do a big update this year. If you were counting on it, I am so sorry. One of my 2011 habits-to-work-on is to update Etsy once a month. Today, though, the idea of adding ten more honeypots/berry bowls/butter crocks to my to-do list makes me want to find a new profession. I was thinking yesterday as I was cranking out 15 of the same little item that ten years ago I'd grandly thought that I wanted to be a production potter, and how fulfilling and wonderful that would be. Now that I almost have become one, it is wonderful, and it is incredibly gratifying to have people tell me how much my work means in their daily lives, I'm realizing that it's also really, really physically tiring. So. I'm letting myself off the hook for a holiday Etsy update. I'll put up some of my birds nest ornaments by Dec 1, because I did make those specifically for etsy, and I'll share my big news (the reason for the production pottery) in a few weeks. I hope you have a peaceful, family-filled Thanksgiving. And if you're shopping this weekend, I hope you'll make an effort to support local small businesses. The families that run them will thank you, as do I. *Happily, thankfully, blessedly, my husband found a new position almost one year to the day after his layoff in November 2009. It is a good fit for him, an I'm grateful that it came along when it did. Hi. It's late afternoon, after a busy day. I'm a little beat. I ran this morning as dawn was breaking- it felt good. Then I spent 4 hours in the studio, throwing and drawing bees on pots and I'm tired and sore. I have a large pot of black beans on the stove that I'm about to turn into sliders, although I'm not sure we'll eat them tonight. Even though it is 95 degrees today, fall is in the air. Yesterday I found bits of orange in the garden- rose hips, pyracantha berries, and some late milkweed blossoms. I'm grateful the humidity has slipped away. I thought I'd share some very good things with you. You know the event I helped to work on? We exceeded our goal of $4000. That was so so wonderful. I found a new magazine that isn't for everyone, but I'm excited about it. We've been simplifying and self-sufficient-ing more and more around here so it's right up my alley. I'm planning a camping trip with a dear friend and her family next month in the TN mountains. SO excited about this. The local response to our Etsy Memphis sale has been so encouraging. I'm working hard on some things to unveil next Friday! I hope you're well and happy. Have a good rest of your week! Back to the sliders for me. I really don't know where the time goes. Last week went by in a blur, but it was full of good things. First, I did get the 850. It isn't a wagon, but the seats fold down and I'm hoping hoping I can get all of my market gear in - shelves, tent, etc. I really mourned velva-the-volvo's passing. But I'm hoping that she has a future with someone else. I threw quite a bit. I made lots. A whole kiln load. All good. And I experimented with plates. That hurt my arms, so I put the idea of wheel-thrown plates out of my mind. Can't do it without pain, so there's no reason to entertain ideas of doing so. Beginning to figure out slab-built options for plates. I sauced and canned eight pounds of heirloom tomatoes. That a fellow at the market gave me as he was packing up. They were catfaced- you know, puckered, multi-lobed, a little scarred, full of character, if a tomato can have such a thing. Really yummy sauce made from organic tomatoes. Free organic tomatoes. So I made this farmer a tomato leaf mug. I'll show you later this week. One night I stayed out for an extra hour with a friend and I realized that she is one of my life mentors. It is so good to have those kind of people in your life- people you can learn from just by watching, and conversation with them only deepens your understanding of their wisdom. I feel really blessed to be actively involved with a multi-generational group of women. I learn so much from my time with them. And the figs are in. I'm picking three times a day. My largest mixing bowl is full of figs in the fridge. I'm looking for teeny giftable-size canning jars to make rosemary-lemon-fig jam. And thinking on how I'll fit in jam-making to my pottery (and swimming) schedule this week. The chickens like figs, too. That's fun. Ok. I hope you had a good weekend and have a good week. I'll see you later. Good morning. Last night we got some much-needed rain- everything is green and lush this morning under still-grey and heavy skies. The humidity in the air makes everything feel slightly tropical-I can almost imagine that I'm in New Orleans, sitting in old metal lawn furniture with a cold drink, waiting for a breeze to stir the air that sits heavy on your skin, like velvet. Some people find the humidity oppressive, but I've always loved how it is almost tactile and soft. Over the past few weeks I've been spending more time on projects around the house than in the studio- I have a rescued butler's pantry (literally rescued, I found it on trash day on someone's curb) that I've been stripping years of paint and grime off it. It's nearly ready to paint. I made new covers for the cushions on the porch. The house got a deep clean (it's dog-shedding season- the vacuum comes out more frequently), and just yesterday we installed some new (to us, also repurposed items) huge planter boxes (4x2, almost 2' deep, and we have them set up so that they're waist-high) along the driveway in the back yard (our house is ca. 1922- the drive goes all the way to the back, where there was originally a small garage and now there's a carport w/ attached storage building that houses my kiln and glazing supplies) for more planting space. My strawberries have almost taken over half of my little kitchen garden plot and need to be moved, and I discovered that last year's tuberose bulbs tripled! I'm considering new window treatments for the den- I took down our old valances this winter and have yet to replace them- still thinking on that, but that little lift will be coming soon. So, lots of house love, and last weekend we had quite a bit of company, including a special visitor and her two sweet kids. We spent most of her visit outside underneath our fig tree, enjoying the shade, our children playing in the tree house, and pleasant company. The combination of visitors, loving on our house, and resuming my morning runs through the neighborhood has had me really thinking about my home and my old neighborhood. Rachel's post resonates with me. I feel lucky to be where we are, in an old, established, modest neighborhood. One where people (mostly) love their homes but no one is ostentatious or trying to outdo. One where I can have a bottle tree in the front yard and no one gets bent out of shape by the enormous bamboo tomato cage sharing space with too-abundant flowerbeds- my neighbors laughed at that instead of being upset. Not to mention my chicken yard, clothesline, and rain barrels. I'm grateful for that (and realizing that more and more, I may be slightly on the fringe. I'm ok with that). The last six months have been difficult- the economy has been rough on everyone. I'm taking a big break from feeling oppressed and worried to be grateful for our blessings and the small things that keep us going. I'm grateful for the big things, too, but sometimes it's the smaller things that add up to help me see the big ones I've been oblivious to. And I'm working in the studio again. I've made several more "Beurre" butter crocks, honey pots that say both "honey" and "miel", lidded salt cellars, berry bowls, and bud vases, because these eight were among the last that I had. I made another dozen last night. I'll be at the farmers market on Saturday, out in the "T", from 7-1. If you're in town, I hope to see you there. Hi. I'm feeling a little better now. My shoulders are gradually coming down from my ears. I have a few things to tell you about. First, if you're in Memphis, my friends the Forresters (of Whitton Farms) have opened their long-awaited Trolley Stop Market. They have a facebook page but not a website yet. I have pottery there, plus there's a plethora of local goodness: honey, organic popcorn and rice, organic flour (hard and soft wheat, kamut, spelt), veggies, flowers, gifts, and really really fabulous pizza. I make a pretty mean pizza, but this nearly topped my own efforts. No, I'm not at all modest about my cooking in general and my pizza in particular. Second, in lieu of having a sale at home this summer, I'm going to make a pretty large etsy update. A honeypot or two, more egg cups, speckled egg ware, berry bowls, mugs. 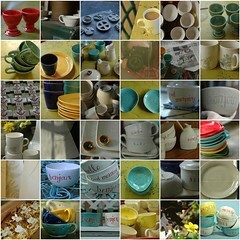 I'm going to photograph the pieces and start listing them today. You my readers, customers, and friends have been so supportive of my work over the past several years. I really appreciate it. My sweet friend Tara took a lovely photo (all of her photos are lovely, frankly) of one of my pieces and used it in her blog post for today. If you have time, go look at her photos. She captures life in such a way that it just looks so pretty. She inspires me to find the pretty moments in the midst of my daily grind. And lately, I need the inspiration and the pretty. I think we all get bogged down and need to be uplifted. Tara's work does that for me, and her photographs of my work remind me of why I chose this work- I believe it makes everyday life happier, even just a little happier, a little more meaningful. Thanks for the reminder, Tara! This Doctors Without Borders update is long overdue. Y'all helped me raise $400 to send for their relief efforts in Haiti. I am overwhelmed with gratitude to you for helping me to do this. As a family, the Bridgmans would have only been able to send a small, small portion of that amount (we channeled our personal support through Episcopal Relief and Development which went directly to St. Vincent's orphanage, school, and hopsital with which our congregation is affiliated.) for relief efforts. This morning, after I saw that the paypal transfer came through, I sent that money on to Doctors Without Borders. breezes, ice, good friends who whisk us away to the pool for the day, and big things, like friends who lend us their generator. Day 4 without power and we're fine, cranky, but fine. Better with the fan and fridge, courtesy of said generator (**ETA, we've had hot water the whole time because the heater, like our stove, is gas. It's been a help). I made this round vase, oh, four years ago. Couldn't sell it at the time. 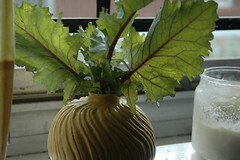 Now I think it looks lovely with the purple-veined kohlrabi leaves in my windowsill. 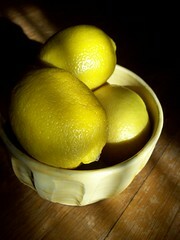 lemons just may be my favorite fruit. These are definitely my favorite bowls. We use them constantly. I need to begin making more for the spring! Hi, I'm back. Sortof. All of the funeral arrangements- visitation, funeral, out of town burial, ended today. I start teaching again tomorrow and I am ready for our routine to be back in place. As I was walking across the street to fetch little boy from his friends' house - they kindly brought him home after school for an extended playdate- I noticed the first blossom of spring in my garden. The periwinkles are always early- sometimes as early as the flowering quinces- but this bright blue peeked out at me from under its blanket of leaves and mulch. It cheered me and reminded me that hope, new life, normalcy, all that we love in live- is just around the corner. My mother in law was a very accomplished woman who loved her life and cheered all of those around her. Thank you so much for all of your kind comments, prayers, support, cards, and thoughts over the past week. I appreciate them more than you know. Thank you, friends. We're getting there.